An arboreal herbivorous marsupial native to Australia. The koala (Phascolarctos cinereus, or, inaccurately, koala bear[a]) is an arboreal herbivorous marsupial native to Australia. It is the only extant representative of the family Phascolarctidae and its closest living relatives are the wombats, which comprise the family Vombatidae.. The koala is found in coastal areas of the mainland's eastern and southern regions, inhabiting Queensland, New South Wales, Victoria, and South Australia. It is easily recognisable by its stout, tailless body and large head with round, fluffy ears and large, spoon-shaped nose. 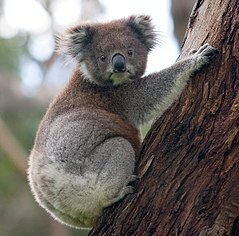 The koala has a body length of 60–85 cm (24–33 in) and weighs 4–15 kg (9–33 lb). Pelage colour ranges from silver grey to chocolate brown. Koalas from the northern populations are typically smaller and lighter in colour than their counterparts further south. These populations possibly are separate subspecies, but this is disputed. 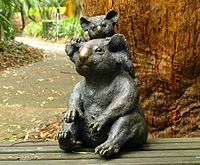 The word koala comes from the Dharug gula. Although the vowel 'u' was originally written in the English orthography as "oo" (in spellings such as coola or koolah), it was changed to "oa", possibly in error. Because of the koala's supposed resemblance to a bear, it was often miscalled the koala bear, particularly by early settlers. The generic name, Phascolarctos, is derived from the Greek words phaskolos "pouch" and arktos "bear". The specific name, cinereus, is Latin for "ash coloured". The koala was given its generic name Phascolarctos in 1816 by French zoologist Henri Marie Ducrotay de Blainville, who would not give it a specific name until further review. In 1819, German zoologist Georg August Goldfuss gave it the binomial Lipurus cinereus. Because Phascolarctos was published first, according to the International Code of Zoological Nomenclature, it has priority as the official name of the genus. French naturalist Anselme Gaëtan Desmarest proposed the name Phascolartos fuscus in 1820, suggesting that the brown-coloured versions were a different species than the grey ones. Other names suggested by European authors included Marodactylus cinereus by Goldfuss in 1820, P. flindersii by René Primevère Lesson in 1827, and P. koala by John Edward Gray in 1827. 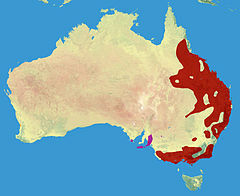 During the Pliocene and Pleistocene, when Australia experienced changes in climate and vegetation, koala species grew larger. 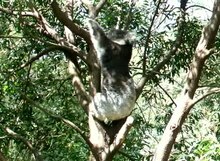 P. cinereus may have emerged as a dwarf form of the giant koala (P. stirtoni). The reduction in the size of large mammals has been seen as a common phenomenon worldwide during the late Pleistocene, and several Australian mammals, such as the agile wallaby, are traditionally believed to have resulted from this dwarfing. A 2008 study questions this hypothesis, noting that P. cinereus and P. stirtoni were sympatric during the middle to late Pleistocene, and possibly as early as the Pliocene. The fossil record of the modern koala extends back at least to the middle Pleistocene. Koalas are herbivorous, and while most of their diet consists of eucalypt leaves, they can be found in trees of other genera, such as Acacia, Allocasuarina, Callitris, Leptospermum, and Melaleuca. They are able to digest the toxins present in eucalyptus leaves due to their production of cytochrome P450, which breaks down these poisons in the liver. 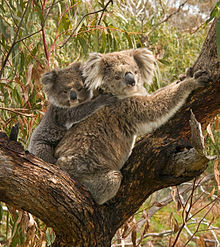 Though the foliage of over 600 species of Eucalyptus is available, the koala shows a strong preference for around 30. They tend to choose species that have a high protein content and low proportions of fibre and lignin. The most favoured species are Eucalyptus microcorys, E. tereticornis, and E. camaldulensis, which, on average, make up more than 20% of their diet. Despite its reputation as a fussy eater, the koala is more generalist than some other marsupial species, such as the greater glider. Since eucalypt leaves have a high water content, the koala does not need to drink often; its daily water turnover rate ranges from 71 to 91 ml/kg of body weight. Although females can meet their water requirements from eating leaves, larger males require additional water found on the ground or in tree hollows. When feeding, a koala holds onto a branch with hindpaws and one forepaw while the other forepaw grasps foliage. 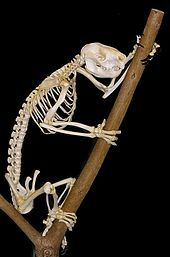 Small koalas can move close to the end of a branch, but larger ones stay near the thicker bases. Koalas consume up to 400 grams (14 oz) of leaves a day, spread over four to six feeding sessions. Despite their adaptations to a low-energy lifestyle, they have meagre fat reserves and need to feed often. Because they get so little energy from their diet, koalas must limit their energy use and sleep or rest 20 hours a day; only 4 hours a day are spent in active movement. They are predominantly active at night and spend most of their waking hours feeding. They typically eat and sleep in the same tree, possibly for as long as a day. On very hot days, a koala may climb down to the coolest part of the tree which is cooler than the surrounding air. The koala hugs the tree to lose heat without panting. On warm days, a koala may rest with its back against a branch or lie on its stomach or back with its limbs dangling. During cold, wet periods, it curls itself into a tight ball to conserve energy. On windy days, a koala finds a lower, thicker branch on which to rest. While it spends most of the time in the tree, the animal descends to the ground to move to another tree, walking on all fours. The koala usually grooms itself with its hindpaws, but sometimes uses its forepaws or mouth. Koalas are asocial animals and spend just 15 minutes a day on social behaviours. In Victoria, home ranges are small and have extensive overlap, while in central Queensland they are larger and overlap less. Koala society appears to consist of "residents" and "transients", the former being mostly adult females and the latter males. Resident males appear to be territorial and dominate others with their larger body size. Alpha males tend to establish their territories close to breeding females, while younger males are subordinate until they mature and reach full size. Adult males occasionally venture outside their home ranges; when they do so, dominant ones retain their status. When a male enters a new tree, he marks it by rubbing his chest gland against the trunk or a branch; males have occasionally been observed to dribble urine on the trunk. This scent-marking behaviour probably serves as communication, and individuals are known to sniff the base of a tree before climbing. Scent marking is common during aggressive encounters. Chest gland secretions are complex chemical mixtures—about 40 compounds were identified in one analysis—that vary in composition and concentration with the season and the age of the individual. 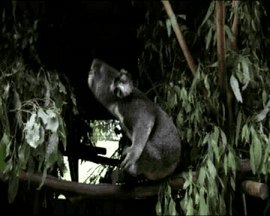 As the young koala approaches six months, the mother begins to prepare it for its eucalyptus diet by predigesting the leaves, producing a faecal pap that the joey eats from her cloaca. The pap is quite different in composition from regular faeces, resembling instead the contents of the caecum, which has a high concentration of bacteria. Eaten for about a month, the pap provides a supplementary source of protein at a transition time from a milk to a leaf diet. The joey fully emerges from the pouch for the first time at six or seven months of age, when it weighs 300–500 g (11–18 oz). It explores its new surroundings cautiously, clinging to its mother for support. By nine months, it weighs over 1 kg (2.2 lb) and develops its adult fur colour. Having permanently left the pouch, it rides on its mother's back for transportation, learning to climb by grasping branches. Gradually, it spends more time away from its mother, and at 12 months it is fully weaned, weighing around 2.5 kg (5.5 lb). When the mother becomes pregnant again, her bond with her previous offspring is permanently severed. Newly weaned young are encouraged to disperse by their mothers' aggressive behaviour towards them. Koalas have few predators; dingos and large pythons may prey on them; birds of prey (such as powerful owls and wedge-tailed eagles) are threats to young. Koalas are generally not subject to external parasites, other than ticks in coastal areas. Koalas may also suffer mange from the mite Sarcoptes scabiei, and skin ulcers from the bacterium Mycobacterium ulcerans, but neither is common. Internal parasites are few and largely harmless. These include the tapeworm Bertiella obesa, commonly found in the intestine, and the nematodes Marsupostrongylus longilarvatus and Durikainema phascolarcti, which are infrequently found in the lungs. In a three-year study of almost 600 koalas admitted to the Australian Zoo Wildlife Hospital in Queensland, 73.8% of the animals were infected with at least one species of the parasitic protozoal genus Trypanosoma, the most common of which was T. irwini. 2 cause Eucalyptus trees to reduce protein and increase tannin concentrations in their leaves, reducing the quality of the food source. The first written reference of the koala was recorded by John Price, servant of John Hunter, the Governor of New South Wales. Price encountered the "cullawine" on 26 January 1798, during an expedition to the Blue Mountains, although his account was not published until nearly a century later in Historical Records of Australia. In 1802, French-born explorer Francis Louis Barrallier encountered the animal when his two Aboriginal guides, returning from a hunt, brought back two koala feet they were intending to eat. Barrallier preserved the appendages and sent them and his notes to Hunter's successor, Philip Gidley King, who forwarded them to Joseph Banks. Similar to Price, Barrallier's notes were not published until 1897. Reports of the first capture of a live "koolah" appeared in The Sydney Gazette in August 1803. Within a few weeks Flinders' astronomer, James Inman, purchased a specimen pair for live shipment to Joseph Banks in England. They were described as 'somewhat larger than the Waumbut (Wombat)'. These encounters helped provide the impetus for King to commission the artist John Lewin to paint watercolours of the animal. Lewin painted three pictures, one of which was subsequently made into a print that was reproduced in Georges Cuvier's The Animal Kingdom (first published in 1827) and several European works on natural history. Botanist Robert Brown was the first to write a detailed scientific description of the koala in 1814, based on a female specimen captured near what is now Mount Kembla in the Illawarra region of New South Wales. Austrian botanical illustrator Ferdinand Bauer drew the animal's skull, throat, feet, and paws. Brown's work remained unpublished and largely unnoticed, however, as his field books and notes remained in his possession until his death, when they were bequeathed to the British Museum (Natural History) in London. They were not identified until 1994, while Bauer's koala watercolours were not published until 1989. British surgeon Everard Home included details of the koala based on eyewitness accounts of William Paterson, who had befriended Brown and Bauer during their stay in New South Wales. Home, who in 1808 published his report in the journal Philosophical Transactions of the Royal Society, gave the animal the scientific name Didelphis coola. "... the eye is placed like that of the Sloth, very close to the mouth and nose, which gives it a clumsy awkward appearance, and void of elegance in the combination ... they have little either in their character or appearance to interest the Naturalist or Philosopher. As Nature however provides nothing in vain, we may suppose that even these torpid, senseless creatures are wisely intended to fill up one of the great links of the chain of animated nature ...". 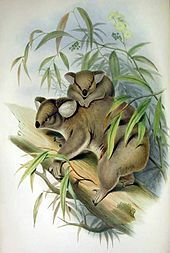 Naturalist and popular artist John Gould illustrated and described the koala in his three-volume work The Mammals of Australia (1845–63) and introduced the species, as well as other members of Australia's little-known faunal community, to the general British public. Comparative anatomist Richard Owen, in a series of publications on the physiology and anatomy of Australian mammals, presented a paper on the anatomy of the koala to the Zoological Society of London. 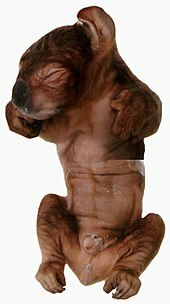 In this widely cited publication, he provided the first careful description of its internal anatomy, and noted its general structural similarity to the wombat. English naturalist George Robert Waterhouse, curator of the Zoological Society of London, was the first to correctly classify the koala as a marsupial in the 1840s. He identified similarities between it and its fossil relatives Diprotodon and Nototherium, which had been discovered just a few years before. Similarly, Gerard Krefft, curator of the Australian Museum in Sydney, noted evolutionary mechanisms at work when comparing the koala to its ancestral relatives in his 1871 The Mammals of Australia. The first living koala in Britain arrived in 1881, purchased by the Zoological Society of London. As related by prosecutor to the society, William Alexander Forbes, the animal suffered an accidental demise when the heavy lid of a washstand fell on it and it was unable to free itself. Forbes used the opportunity to dissect the fresh female specimen, thus was able to provide explicit anatomical details on the female reproductive system, the brain, and the liver—parts not previously described by Owen, who had access only to preserved specimens. Scottish embryologist William Caldwell—well known in scientific circles for determining the reproductive mechanism of the platypus—described the uterine development of the koala in 1884, and used the new information to convincingly place the koala and the monotremes into an evolutionary time frame. Prince Henry, Duke of Gloucester, visited the Koala Park Sanctuary in Sydney in 1934 and was "intensely interested in the bears". His photograph, with Noel Burnet, the founder of the park, and a koala, appeared in The Sydney Morning Herald. After World War II, when tourism to Australia increased and the animals were exported to zoos overseas, the koala's international popularity rose. Several political leaders and members of royal families had their pictures taken with koalas, including Queen Elizabeth II, Prince Harry, Crown Prince Naruhito, Crown Princess Masako, Pope John Paul II, US President Bill Clinton, Soviet premier Mikhail Gorbachev, South African President Nelson Mandela, Prime Minister Tony Abbott, and Russian President Vladimir Putin. The koala is well known worldwide and is a major draw for Australian zoos and wildlife parks. It has been featured in advertisements, games, cartoons, and as soft toys. It benefited the national tourism industry by over an estimated billion Australian dollars in 1998, a figure that has since grown. In 1997, half of visitors to Australia, especially those from Korea, Japan, and Taiwan, sought out zoos and wildlife parks; about 75% of European and Japanese tourists placed the koala at the top of their list of animals to see. According to biologist Stephen Jackson: "If you were to take a straw poll of the animal most closely associated with Australia, it's a fair bet that the koala would come out marginally in front of the kangaroo". Factors that contribute to the koala's enduring popularity include its child-like body proportions and teddy bear-like face. The koala is featured in the Dreamtime stories and mythology of indigenous Australians. The Tharawal people believed that the animal helped row the boat that brought them to the continent. Another myth tells of how a tribe killed a koala and used its long intestines to create a bridge for people from other parts of the world. This narrative highlights the koala's status as a game animal and the length of its intestines. Several stories tell of how the koala lost its tail. In one, a kangaroo cuts it off to punish the koala for being lazy and greedy. Tribes in both Queensland and Victoria regarded the koala as a wise animal and sought its advice. Bidjara-speaking people credited the koala for turning barren lands into lush forests. The animal is also depicted in rock carvings, though not as much as some other species. Early European settlers in Australia considered the koala to be a prowling sloth-like animal with a "fierce and menacing look". At the beginning of the 20th century, the koala's reputation took a more positive turn, largely due to its growing popularity and depiction in several widely circulated children's stories. It is featured in Ethel Pedley's 1899 book Dot and the Kangaroo, in which it is portrayed as the "funny native bear". Artist Norman Lindsay depicted a more anthropomorphic koala in The Bulletin cartoons, starting in 1904. This character also appeared as Bunyip Bluegum in Lindsay's 1918 book The Magic Pudding. Perhaps the most famous fictional koala is Blinky Bill. Created by Dorothy Wall in 1933, the character appeared in several books and has been the subject of films, TV series, merchandise, and a 1986 environmental song by John Williamson. The first Australian stamp featuring a koala was issued by the Commonwealth in 1930. A television ad campaign for Australia's national airline Qantas, starting in 1967 and running for several decades, featured a live koala (voiced by Howard Morris), who complained that too many tourists were coming to Australia and concluded "I hate Qantas". The series has been ranked among the greatest commercials of all time. The song "Ode to a Koala Bear" appears on the B-side of the 1983 Paul McCartney/Michael Jackson duet single Say Say Say. A koala is the main character in Hanna-Barbera's The Kwicky Koala Show and Nippon Animation's Noozles, both of which were animated cartoons of the early 1980s. Food products shaped like the koala include the Caramello Koala chocolate bar and the bite-sized cookie snack Koala's March. Dadswells Bridge in Victoria features a tourist complex shaped like a giant koala, and the Queensland Reds rugby team has a koala as its mascot. The Platinum Koala coin features the animal on the reverse and Elizabeth II on the obverse. The drop bear is an imaginary creature in contemporary Australian folklore featuring a predatory, carnivorous version of the koala. This hoax animal is commonly spoken about in tall tales designed to scare tourists. While koalas are typically docile herbivores, drop bears are described as unusually large and vicious marsupials that inhabit treetops and attack unsuspecting people (or other prey) that walk beneath them by dropping onto their heads from above. While the koala was previously classified as Least Concern on the Red List, it was uplisted to Vulnerable in 2016. Australian policy makers declined a 2009 proposal to include the koala in the Environment Protection and Biodiversity Conservation Act 1999. In 2012, the Australian government listed koala populations in Queensland and New South Wales as Vulnerable, because of a 40% population decline in the former and a 33% decline in the latter. Populations in Victoria and South Australia appear to be abundant; however, the Australian Koala Foundation argues that the exclusion of Victorian populations from protective measures is based on a misconception that the total koala population is 200,000, whereas they believe it is probably less than 100,000. Koalas were hunted for food by Aboriginals. A common technique used to capture the animals was to attach a loop of ropey bark to the end of a long, thin pole, so as to form a noose. This would be used to snare an animal high in a tree, beyond the reach of a climbing hunter; an animal brought down this way would then be killed with a stone hand axe or hunting stick (waddy). According to the customs of some tribes, it was considered taboo to skin the animal, while other tribes thought the animal's head had a special status, and saved them for burial. "The shooting of our harmless and lovable native bear is nothing less than barbarous ... No one has ever accused him of spoiling the farmer's wheat, eating the squatter's grass, or even the spreading of the prickly pear. There is no social vice that can be put down to his account ... He affords no sport to the gun-man ... And he has been almost blotted out already from some areas." Despite the growing movement to protect native species, the poverty brought about by the drought of 1926–28 led to the killing of another 600,000 koalas during a one-month open season in August 1927. In 1934, Frederick Lewis, the Chief Inspector of Game in Victoria, said that the once-abundant animal had been brought to near extinction in that state, suggesting that only 500–1000 remained. The first successful efforts at conserving the species were initiated by the establishment of Brisbane's Lone Pine Koala Sanctuary and Sydney's Koala Park Sanctuary in the 1920s and 1930s. The owner of the latter park, Noel Burnet, became the first to successfully breed koalas and earned a reputation as the foremost contemporary authority on the marsupial. In 1934, David Fleay, curator of Australian mammals at the Melbourne Zoo, established the first Australian faunal enclosure at an Australian zoo, and featured the koala. This arrangement allowed him to undertake a detailed study of its diet in captivity. Fleay later continued his conservation efforts at Healesville Sanctuary and the David Fleay Wildlife Park. Since 1870, koalas have been introduced to several coastal and offshore islands, including Kangaroo Island and French Island. Their numbers have significantly increased, and since the islands are not large enough to sustain such high koala numbers, overbrowsing has become a problem. In the 1920s, Lewis initiated a program of large-scale relocation and rehabilitation programs to transfer koalas whose habitat had become fragmented or reduced to new regions, with the intent of eventually returning them to their former range. For example, in 1930–31, 165 koalas were translocated to Quail Island. After a period of population growth, and subsequent overbrowsing of gum trees on the island, about 1,300 animals were released into mainland areas in 1944. The practice of translocating koalas became commonplace; Victorian State manager Peter Menkorst estimated that from 1923 to 2006, about 25,000 animals were translocated to more than 250 release sites across Victoria. Since the 1990s, government agencies have tried to control their numbers by culling, but public and international outcry has forced the use of translocation and sterilisation, instead. One of the biggest anthropogenic threats to the koala is habitat destruction and fragmentation. In coastal areas, the main cause of this is urbanisation, while in rural areas, habitat is cleared for agriculture. Native forest trees are also taken down to be made into wood products. In 2000, Australia ranked fifth in the world by deforestation rates, having cleared 564,800 hectares (1,396,000 acres). The distribution of the koala has shrunk by more than 50% since European arrival, largely due to fragmentation of habitat in Queensland. The koala's "vulnerable" status in Queensland and New South Wales means that developers in these states must consider the impacts on this species when making building applications. In addition, koalas live in many protected areas. While urbanisation can pose a threat to koala populations, the animals can survive in urban areas provided enough trees are present. Urban populations have distinct vulnerabilities: collisions with vehicles and attacks by domestic dogs kill about 4,000 animals every year. Injured koalas are often taken to wildlife hospitals and rehabilitation centres. In a 30-year retrospective study performed at a New South Wales koala rehabilitation centre, trauma (usually resulting from a motor vehicle accident or dog attack) was found to be the most frequent cause of admission, followed by symptoms of Chlamydia infection. Wildlife caretakers are issued special permits, but must release the animals back into the wild when they are either well enough or, in the case of joeys, old enough. As with most native animals, the koala cannot legally be kept as a pet in Australia or anywhere else. ^ Koala bear is a common term outside of Australia, though koalas are marsupials, not bears. ^ a b c d e f Gordon, G.; Menkhorst, P.; Robinson, T.; Lunney, D.; Martin, R.; Ellis, M. (2008). "Phascolarctos cinereus". IUCN Red List of Threatened Species. Version 2012.2. International Union for Conservation of Nature. Retrieved 8 March 2013. ^ a b Moyal, p. 45. ^ Groves, C. P. (2005). "Order Diprotodontia". In Wilson, D. E.; Reeder, D. M (eds.). Mammal Species of the World: A Taxonomic and Geographic Reference (3rd ed.). Johns Hopkins University Press. p. 43. ISBN 978-0-8018-8221-0. OCLC 62265494. ^ Groves, C. P. (2005). "Suborder Vombatiformes". In Wilson, D. E.; Reeder, D. M (eds.). Mammal Species of the World: A Taxonomic and Geographic Reference (3rd ed.). Johns Hopkins University Press. pp. 43–44. ISBN 978-0-8018-8221-0. OCLC 62265494. ^ "Koala (Phascolarctos cinereus) Listing". Department of the Environment and Energy. Australian Government. Retrieved 1 September 2016. ^ Dixon, R. M. W.; Moore, B.; Ramson, W. S.; Thomas, M. (2006). Australian Aboriginal Words in English: Their Origin and Meaning (2nd ed.). Oxford University Press. p. 65. ISBN 978-0-19-554073-4. ^ Leitner, G.; Sieloff, I. (1998). "Aboriginal words and concepts in Australian English". World Englishes. 17 (2): 153–69. doi:10.1111/1467-971X.00089. ^ Kidd, D. A. (1973). Collins Latin Gem Dictionary. Collins. p. 53. ISBN 978-0-00-458641-0. ^ a b Weisbecker, V.; Archer, M. (2008). "Parallel evolution of hand anatomy in kangaroos and vombatiform marsupials: Functional and evolutionary implications". Palaeontology. 51 (2): 321–38. doi:10.1111/j.1475-4983.2007.00750.x. ^ de Blainville, H. (1816). "Prodrome d'une nouvelle distribution systématique du règne animal". Bulletin de la Société Philomáthique, Paris (in French). 8: 105–24. ^ Long, J. A. (2002). Prehistoric Mammals of Australia and New Guinea: One Hundred Million Years of Evolution. Johns Hopkins University Press. pp. 77–82. ISBN 978-0-8018-7223-5. ^ Asher, R.; Horovitz, I.; Sánchez-Villagra, M. (2004). "First combined cladistic analysis of marsupial mammal interrelationships". Molecular Phylogenetics and Evolution. 33 (1): 240–50. doi:10.1016/j.ympev.2004.05.004. PMID 15324852. ^ Beck, R. M. D. (2008). "A dated phylogeny of marsupials using a molecular supermatrix and multiple fossil constraints". Journal of Mammalogy. 89 (1): 175–89. doi:10.1644/06-MAMM-A-437.1. ^ a b c d e Louys, J.; Aplin, K.; Beck, R. M. D.; Archer, M. (2009). "Cranial anatomy of Oligo-Miocene koalas (Diprotodontia: Phascolarctidae): Stages in the evolution of an extreme leaf-eating specialization". Journal of Vertebrate Paleontology. 29 (4): 981–92. doi:10.1671/039.029.0412. ^ a b Archer, M.; Arena, R.; Bassarova, M.; Black, K.; Brammall, J.; Cooke, B. M.; Creaser, P; Crosby, K.; Gillespie, A.; Godthelp, H.; Gott, M.; Hand, S. J.; Kear, B. P.; Krikmann, A.; Mackness, B.; Muirhead, J.; Musser, A.; Myers, T.; Pledge, N. S.; Wang, Y.; Wroe, S. (1999). "The evolutionary history and diversity of Australian mammals". Australian Mammalogy. 21: 1–45. ^ Black, K.; Archer, M.; Hand, S. J. (2012). "New Tertiary koala (Marsupialia, Phascolarctidae) from Riversleigh, Australia, with a revision of phascolarctid phylogenetics, paleoecology, and paleobiodiversity". Journal of Vertebrate Paleontology. 32 (1): 125–38. doi:10.1080/02724634.2012.626825. ^ Price, G. J. (2008). "Is the modern koala (Phascolarctos cinereus) a derived dwarf of a Pleistocene giant? Implications for testing megafauna extinction hypotheses". Quaternary Science Reviews. 27 (27–28): 2516–21. doi:10.1016/j.quascirev.2008.08.026. ^ a b Price, G. J. (2013). "Long-term trends in lineage 'health' of the Australian koala (Mammalia: Phascolarctidae): Using paleo-diversity to prioritize species for conservation". In Louys, J. (ed.). Paleontology in Ecology and Conservation. Springer Earth System Sciences. Springer. pp. 171–92. ISBN 978-3-642-25037-8. ^ a b Martin and Handasyde, p. 7. ^ a b Houlden, B. A.; Costello, B. H.; Sharkey, D.; Fowler, E. V.; Melzer, A.; Ellis, W.; Carrick, F.; Baverstock, P. R.; Elphinstone, M. S. (1999). "Phylogeographic differentiation in the mitochondrial control region in the koala, Phascolarctos cinereus (Goldfuss 1817)". Molecular Ecology. 8 (6): 999–1011. doi:10.1046/j.1365-294x.1999.00656.x. PMID 10434420. ^ Houlden, B. A.; England, P. R.; Taylor A. C.; Greville, W. D.; Sherwin, W. B. (1996). "Low genetic variability of the koala Phascolarctos cinereus in south-eastern Australia following a severe population bottleneck". Molecular Ecology. 5 (2): 269–81. doi:10.1046/j.1365-294x.1996.00089.x. PMID 8673272. ^ Wilmer, J. M. W.; Melzer, A.; Carrick, F.; Moritz, C. (1993). "Low genetic diversity and inbreeding depression in Queensland Koalas". Wildlife Research. 20 (2): 177–87. doi:10.1071/WR9930177. ^ Tsangaras, K.; Ávila-Arcos, M. C.; Ishida, Y.; Helgen, K. M.; Roca, A. L.; Greenwood, A. D. (2012). "Historically low mitochondrial DNA diversity in koalas (Phascolarctos cinereus)". BMC Genetics. 13 (1): 92. doi:10.1186/1471-2156-13-92. PMC 3518249. PMID 23095716. ^ Lee, K. E.; Seddon, J. M.; Corley, S.; Williams, E.; Johnston, S.; Villers, D.; Preece, H.; Carrick, F. (2010). "Genetic variation and structuring in the threatened koala populations of Southeast Queensland". Conservation Genetics. 11 (6): 2091–103. doi:10.1007/s10592-009-9987-9. ^ a b c Jackson, pp. 1–4. ^ a b c Nowak, R. (2005). Walker's Marsupials of the World. Johns Hopkins University Press. pp. 135–36. ISBN 978-0-8018-8211-1. ^ a b c d e Jackson, S. (2003). Australian Mammals: Biology and Captive Management. CSIRO Publishing. pp. 147–51. ISBN 978-0-643-06635-9. ^ Martin and Handasyde, p. 55. ^ Young, A. H. (1879). "The Male Generative Organs of the Koala (Phascolarctos cinereus)". Journal of Anatomy and Physiology. 13 (Pt 3): 305–317. PMC 1309851. PMID 17231260. 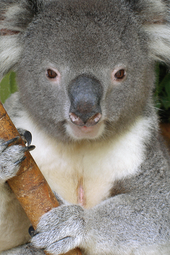 ^ "UQ researchers unlock another koala secret". UQ News. University of Queensland. 9 May 2001. Retrieved 26 June 2013. ^ a b c d "Physical Characteristics". Australian Koala Foundation. Retrieved 2 April 2013. ^ Degabriele, R.; Dawson, T. J. (1979). "Metabolism and heat balance in an arboreal marsupial, the koala (Phascolarctos cinereus)". Journal of Comparative Physiology B. 134 (4): 293–301. doi:10.1007/BF00709996. ISSN 1432-1351. ^ Martin and Handasyde, p. 5. ^ Coppock, C. A. (2007). Contrast: An Investigator's Basic Reference Guide to Fingerprint Identification Concepts. Charles C Thomas Publisher. p. 21. ISBN 978-0-398-08514-8. ^ a b c d Jackson, p. 81. ^ Carmen de Miguel; Maciej Henneberg (1998). "Encephalization of the Koala, Phascolarctos Cinerues". ^ a b Martin and Handasyde, p. 52. ^ a b Tyndale-Biscoe, p. 234. ^ a b Charlton, B. D.; Frey, R.; McKinnon, A. J.; Fritsch, G.; Fitch, W. T.; Reby, D. (2013). "Koalas use a novel vocal organ to produce unusually low-pitched mating calls". Current Biology. 23 (23): R1035–6. doi:10.1016/j.cub.2013.10.069. PMID 24309276. Lay summary – Koalas' low-pitched voice explained by unique organ – ScienceDaily. ^ a b Jackson, p. 76. ^ a b c d e Martin and Handasyde, pp. 46–49. ^ Lee, A. L.; Martin, R. W. (1988). The Koala: A Natural History. New South Wales University Press. p. 20. ISBN 978-0-86840-354-0. ^ a b c d Tyndale-Biscoe, p. 231. ^ Logan, M. (2001). "Evidence for the occurrence of rumination-like behaviour, or merycism, in the koala (Phascolarctos cinereus, Goldfuss)". Journal of Zoology. 255 (1): 83–87. doi:10.1017/S0952836901001121. ^ a b c McGregor, D. C.; Kerr, S. E.; Krockenberger, A. K. (2013). Festa-Bianchet, Marco (ed.). "The distribution and abundance of an island population of koalas (Phascolarctos cinereus) in the far north of their geographic range". PLOS ONE. 8 (3): e59713. doi:10.1371/journal.pone.0059713. PMC 3601071. PMID 23527258. ^ Martin and Handasyde, pp. 12–13. ^ Smith, A. G.; McAlpine, C. A.; Rhodes, J. R.; Lunney, D.; Seabrook, L.; Baxter, G. (2013). "Out on a limb: Habitat use of a specialist folivore, the koala, at the edge of its range in a modified semi-arid landscape". Landscape Ecology. 28 (3): 418–26. doi:10.1007/s10980-013-9846-4. ^ a b Jackson, pp. 73–74. ^ Tuigtear anois cén fáth go dtig leis an gcóála duilleoga eocailipe nimhneacha a ithe (ga) Tuairisc.ie, 17 July 2018. Retrieved 22 July 2018. ^ Koalas are eating their forests into extinction — even feasting on poisonous eucalyptus plants National Post, 4 July 2018. Retrieved 22 July 2018. ^ Martin, R. (2001). "Koala". In Macdonald, D. (ed.). Encyclopedia of Mammals (2nd ed.). Oxford University Press. pp. 852–54. ISBN 978-0-7607-1969-5. ^ Osawa, R. (1993). "Dietary preferences of Koalas, Phascolarctos cinereus (Marsupiala: Phascolarctidae) for Eucalyptus spp. with a specific reference to their simple sugar contents". Australian Mammalogy. 16 (1): 85–88. ^ a b c Jackson, pp. 93–94. ^ Grand, T. I.; Barboza, P. S. (2001). "Anatomy and development of the koala, Phascolarctos cinereus: An evolutionary perspective on the superfamily Vombatoidea". Anatomy and Embryology. 203 (3): 211–23. doi:10.1007/s004290000153. PMID 11303907. ^ a b Martin and Handasyde, p. 39. ^ "Koalas hug trees to keep cool". Australian Geographic. 4 June 2014. Retrieved 18 November 2014. ^ Gill, Victoria (4 June 2014). "Koalas hug trees to lose heat". BBC News. ^ a b Jackson, pp. 98–99. ^ Ellis, W. A.; Hale, P. T.; Carrick, F. (2002). "Breeding dynamics of koalas in open woodlands". Wildlife Research. 29 (1): 19–25. doi:10.1071/WR01042. ^ a b Moyal, p. 191. ^ Martin and Handasyde, pp. 54–56. ^ Smith, M. (1980). "Behaviour of the Koala, Phascolarctos cinereus (Goldfuss), in captivity IV. Scent-marking". Australian Wildlife Research. 7 (1): 35–40. doi:10.1071/WR9800035. ^ a b Tobey, J. R.; Nute, T. R.; Bercovitch, F. B. (2009). "Age and seasonal changes in the semiochemicals of the sternal gland secretions of male koalas (Phascolarctos cinereus)". Australian Journal of Zoology. 57 (2): 111–18. doi:10.1071/ZO08090. ^ a b Smith, M. (1980). "Behaviour of the Koala, Phascolarctos cinereus (Goldfuss), in captivity III*. Vocalisations". Australian Wildlife Research. 7 (1): 13–34. doi:10.1071/WR9800013. ^ a b Martin and Handasyde, pp. 56–58. ^ Ellis, W.; Bercovitch, F.; FitzGibbon, S.; Roe, P.; Wimmer, J.; Melzer, A.; Wilson, R. (2011). "Koala bellows and their association with the spatial dynamics of free-ranging koalas" (PDF). Behavioral Ecology. 22 (2): 372–77. doi:10.1093/beheco/arq216. ^ Charlton, B. D.; Ellis, W. A. H.; McKinnon, A. J.; Cowin, G. J.; Brumm, J.; Nilsson, K.; Fitch, W. T. (2011). "Cues to body size in the formant spacing of male koala (Phascolarctos cinereus) bellows: Honesty in an exaggerated trait". Journal of Experimental Biology. 214 (20): 3414–22. doi:10.1242/jeb.061358. PMID 21957105. ^ Charlton, B. D.; Ellis, W. A. H.; Brumm, J.; Nilsson, K.; Fitch, W. T. (2012). "Female koalas prefer bellows in which lower formants indicate larger males". Animal Behaviour. 84 (6): 1565–71. doi:10.1016/j.anbehav.2012.09.034. ^ a b Smith, M. (1980). "Behaviour of the Koala, Phascolarctos cinereus (Goldfuss), in captivity VI*. Aggression". Australian Wildlife Research. 7 (2): 177–90. doi:10.1071/WR9800177. ^ Martin and Handasyde, pp. 58–60. ^ Gifford, A.; Fry, G.; Houlden, B. A.; Fletcher, T. P.; Deane, E. M. (2002). "Gestational length in the koala, Phascolarctos cinereus". Animal Reproduction Science. 70 (3): 261–66. doi:10.1016/S0378-4320(02)00010-6. PMID 11943495. ^ a b Martin and Handasyde, pp. 60–61. ^ Martin and Handasyde, p. 62. ^ Martin and Handasyde, p. 63. ^ Martin and Handasyde, pp. 64–66. ^ a b Martin and Handasyde, pp. 66–69. ^ Ellis, W. A. H.; Bercovitch, F. B. (2011). "Body size and sexual selection in the koala". Behavioral Ecology and Sociobiology. 65 (6): 1229–35. doi:10.1007/s00265-010-1136-4. ^ Martin and Handasyde, pp. 69. ^ a b c Martin and Handasyde, pp. 71–75. ^ Lanyon, J. M.; Sanson, G. D. (1986). "Koala (Phascolarctos cinereus) dentition and nutrition. II. Implications of tooth wear in nutrition". Journal of Zoology. 209 (2): 169–81. doi:10.1111/j.1469-7998.1986.tb03573.x. ^ Spratt, D. M.; Gill, P. A. (1998). "Durikainema phascolarcti n. sp. (Nematoda: Muspiceoidea: Robertdollfusidae) from the pulmonary arteries of the koala Phascolarctos cinereus with associated pathological changes". Systematic Parasitology. 39 (2): 101–06. doi:10.1023/A:1005957809179. ^ McInnes, L. M.; Gillett, A.; Hanger, J.; Reid, S. A.; Ryan, U. M. (2011). "The potential impact of native Australian trypanosome infections on the health of koalas (Phascolarctos cinereus)". Parasitology (Submitted manuscript). 138 (7): 873–83. doi:10.1017/S0031182011000369. PMID 21524321. ^ Martin and Handasyde p. 114. ^ Stoye, J. P. (2006). "Koala retrovirus: A genome invasion in real time". Genome Biology. 7 (11): 241. doi:10.1186/gb-2006-7-11-241. PMC 1794577. PMID 17118218. ^ Martin and Handsyde, p. 26. ^ Adams-Hosking, C.; Grantham, H. S.; Rhodes, J. R.; McAlpine, C.; Moss, P. T. (2011). "Modelling climate-change-induced shifts in the distribution of the koala". Wildlife Research. 38 (2): 122–30. doi:10.1071/WR10156. ^ Seabrook, L.; McAlpine, C.; Baxter, G.; Rhodes, J.; Bradley, A.; Lunney, D. (2011). "Drought-driven change in wildlife distribution and numbers: A case study of koalas in south west Queensland". Wildlife Research. 38 (6): 509–24. doi:10.1071/WR11064. ^ a b Foden, W.; Stuart, S. N. (2009). Species and Climate Change: More than Just the Polar Bear (PDF) (Report). IUCN Species Survival Commission. pp. 36–37. ^ Phillips, B. (1996). Koalas: The Little Australians We'd All Hate to Lose. Australian Government Publishing Service. p. 13. ISBN 978-0-644-09697-3. ^ Home, E. (1808). "An account of some peculiarities in the anatomical structure of the wombat, with observations on the female organs of generation". Philosophical Transactions of the Royal Society. 98: 304–12. doi:10.1098/rstl.1808.0020. ^ Perry, G. (1811). "Koalo, or New Holland Sloth". Arcana; or the Museum of Natural History: 109. ^ Owen, R. (1836). "Richard Owen, esq., in the chair". Proceedings of the Zoological Society of London. 4 (1): 109–13. doi:10.1111/j.1096-3642.1836.tb01376.x. ^ Caldwell, H. (1884). "On the arrangement of the embryonic membranes in marsupial mammals". Quarterly Journal of Microscopical Science. s2–24 (96): 655–58. ^ "At Koala Park". The Sydney Morning Herald (NSW : 1842 – 1954). NSW: National Library of Australia. 28 November 1934. p. 14. Retrieved 14 May 2013. ^ a b Jackson, pp. 155–58. 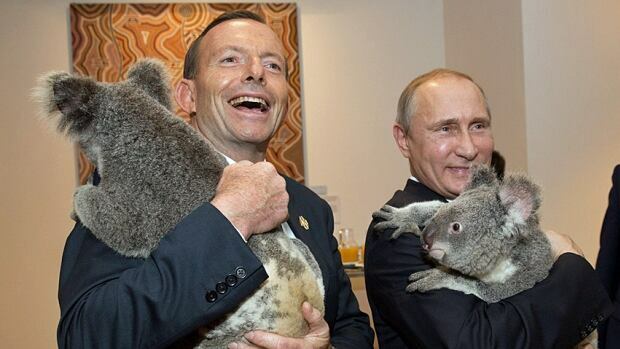 ^ "world-leaders-meet-a-koala.jpg 620×349 pixels". I.cbc.ca. Retrieved 25 May 2016. ^ a b Jackson, p. ix. ^ Martin and Handasyde, p. 3. ^ Martin and Handasyde, p. 17. ^ a b Jackson, pp. 142–44. ^ a b Jackson, pp. 149–52. ^ "Teddy will be missed". Boca Raton News. 15 March 1976. Retrieved 16 August 2013. ^ "100 greatest TV spots of all time". Drew Babb & Associates. Archived from the original on 13 November 2013. Retrieved 16 August 2013. ^ "Platinum Australian Koala". Goldline.com. 13 October 2018. Retrieved 28 March 2013. ^ Janssen, Volker (2012). "Indirect Tracking of Drop Bears Using GNSS Technology". Australian Geographer (Submitted manuscript). 43 (4): 445–452. doi:10.1080/00049182.2012.731307. ^ Seal, Graham (2010). Great Australian Stories: Legends, Yarns and Tall Tales. ReadHowYouWant.com. p. 136. ISBN 9781458716811. ^ a b "Koalas added to threatened species list". ABC. 30 April 2012. Retrieved 2 May 2012. ^ Evans, R. (2007). A History of Queensland. Cambridge University Press. p. 168. ISBN 978-0-521-87692-6. ^ Martin and Handasyde, pp. 104–07. ^ a b Holtcamp, W. (5 January 2007). 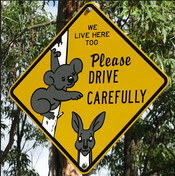 "Will Urban Sprawl KO the Koala?". National Wildlife. Retrieved 22 March 2013. ^ Griffith, J. E.; Dhand, N. K.; Krockenberger, M. B.; Higgins, D. P. (2013). "A retrospective study of admission trends of koalas to a rehabilitation facility over 30 years". Journal of Wildlife Diseases. 49 (1): 18–28. doi:10.7589/2012-05-135. hdl:2123/14628. PMID 23307368. ^ "Frequently asked questions (FAQs)". Australian Koala Foundation. Retrieved 21 March 2013. Jackson, S. (2010). Koala: Origins of an Icon (2nd ed.). Allen & Unwin. ISBN 978-1-74237-323-2. Martin, R. W.; Handasyde, K. A. (1999). The Koala: Natural History, Conservation and Management (2nd ed.). New South Wales University Press. ISBN 978-1-57524-136-4. Moyal, A. (2008). Koala: A Historical Biography. Australian Natural History Series. CSIRO Publishing. ISBN 978-0-643-09401-7. Tyndale-Biscoe, H. (2005). Life of Marsupials. CSIRO Publishing. ISBN 978-0-643-06257-3. Wikimedia Commons has media related to Phascolarctos cinereus. 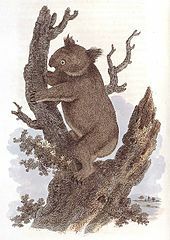 Wikisource has the text of the 1920 Encyclopedia Americana article Koala. Look up koala in Wiktionary, the free dictionary.